Using a small pastry brush, apply honey in a swirl design from bottom to top of the interior of each glass mug. Spoon 2 tablespoons rainbow colored sprinkles inside each mug. Gently rotate (tilt mug) to coat the painted honey swirls with sprinkles. Pour out excess sprinkles. Set aside mugs. To make the milkshake: If indoors, toast marshmallows under a broiler on a foil-lined baking sheet, until all sides are golden brown. If outdoors, toast marshmallows over an open fire using wire hangers as skewers. Rotate each marshmallow until all sides are golden brown. (Like making s’mores). Scoop vanilla bean ice cream, milk and Greek yogurt into the blender. Blend for 20 seconds or so. Add toasted marshmallows. Pulse until incorporated and remember not to over mix. Consistency should remain thick. 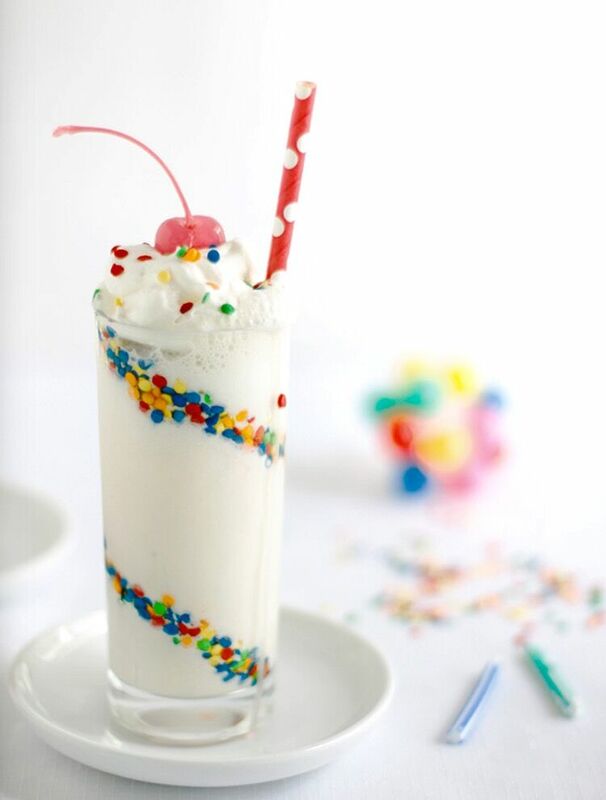 Gently pour shake into each confetti sprinkle adorned glass mug. Top with whipped cream. Garnish with extra rainbow sprinkles and a cherry. Adorn with playful straw. (Option to add mini American flag). Serve immediately .